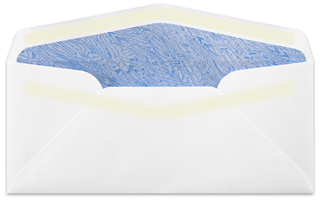 There are two major ways we can add self seal to almost any envelope. Each has its differing advantages. We will discuss these options and what they mean to you. You will see these options on the pricing page of many of our envelopes. If you don't see it, it does not mean it can't be done so please call if you are interested. 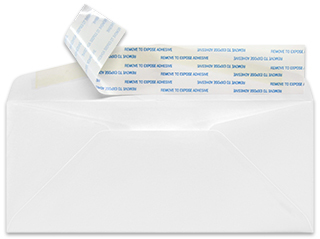 Quick Stick Seal is a self seal process where two strips of latex glue are added to the envelope, one to the flap and one to the body of the envelope. The latex glue on the flap will only stick to the latex glue that is added to the body of the envelope. When the flap is closed the envelope will seal. The process of Quick Stick being added to an envelope is usually the most cost effective way to add self seal to an envelope that does not already have it. If you are having your envelopes Custom Printed by our high speed presses the Quick Stick must be added after the printing process. Adding Quick Stick to your envelopes will add about 2-4 business days to the processing of your order and your envelopes will arrive with the flaps extended. Quick Stick seal has a shelf life of about one year. Peel & Stick is a process where a strip of adhesive is added to the flap and a special strip of paper is placed on top of the adhesive. This adhesive is very aggressive and will stick to where ever it touches the paper of the envelope. When the strip of paper is removed and the flap close the envelope will seal. The cost of adding Peel & Stick to an envelope that does not have it is slightly more expensive than adding Quick Stick. It does have the advantage of being able to be printed after the Peel & Stick process and can be stored prior to printing. Many of the items we stock in self seal are stocked with peel & stick because of this advantage. The peel & stick process will add about 2-4 days to the processing time of your order. Peel & Stick has a shelf life of about 1 year but can last longer.